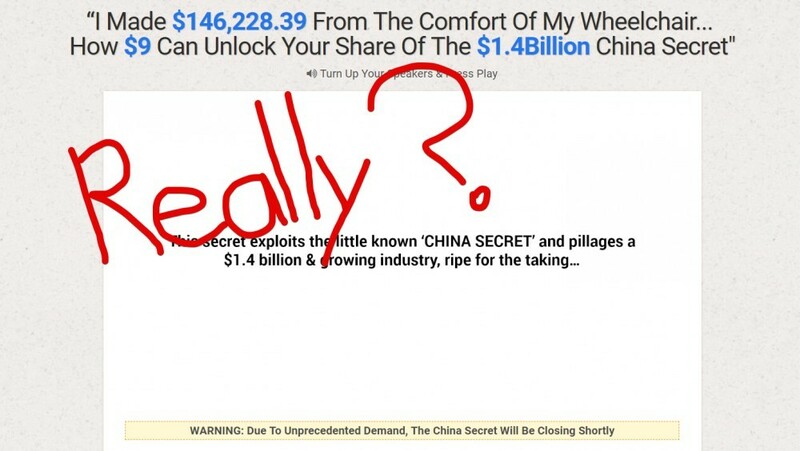 →The China Secret – Another Really.. Really Stupid Scam! The China Secret – Another Really.. Really Stupid Scam! So there is this new system being promoted online called “The China Secret” that can supposedly make you rich… But unfortunately it is all a lie. This is just another scam system that is going to leave you with less money than when you started. Fortunately it doesn’t cost all that much so if you do buy into it you want that much worse off… But the point is that it is a scam and you should avoid it. And in this review I will be explaining to you why I say this. Wouldn’t it be nice if you could really get in on some awesome new system that exploits a new and emerging industry like this? Any would be that easy to make tons of money? That would be incredible… But unfortunately when it comes to the online world, if something sounds a little bit too good to be true it is more than likely a scam. This system just reminds me of other scams I’ve exposed recently such as The Profit Shortcut and Wealth Project. So “The China Secret” is supposedly some new “secret” system that “pillages a $1.4 billion industry”. This guy claims to be a 55-year-old who used to work in the corporate world but ended up losing his job and eventually losing his wife because of it. He then spent countless nights trying to make money online but just ended up falling victim to a bunch of scams, like many other people do. But… He claims that if you have fallen victim to scams like he has, it is not your fault, reason being that the gurus out there are just selling you outdated techniques/methods that no longer work. He claims that he is not like these gurus in that he really wants to help people out. Now he is making tons of money with this system, he tells you that he just wants to give back. And according to him the time to buy in his right now. In the video it is mentioned that some “global financial crisis is going to happen in 2019”. But… As you already know… Pretty much everything he tells you is a bunch of crap. 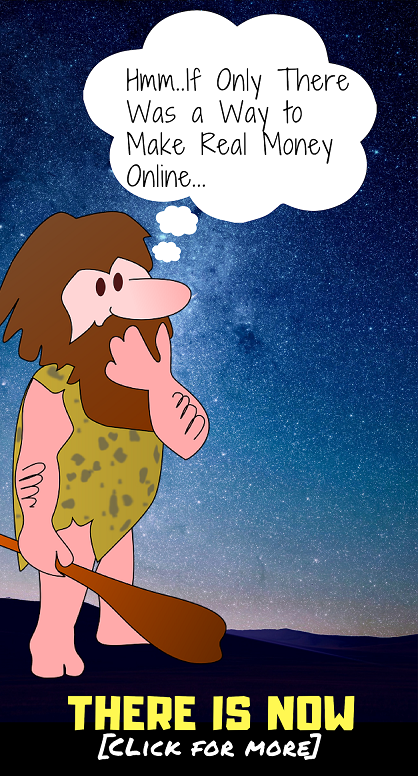 While it is true that there are a lot of financial crises going on right now, he is just trying to get in your head and scare you into buying his stupid system. This is typical fear mongering that is a common sales tactic employed by online scammers. He says that his system makes money by exploiting the new “messenger marketing” opportunity with Facebook Messenger. He talks about how the Chinese messenger powerhouse, called WeChat, is raking in billions of dollars per year and that Facebook is starting to catch up by rolling out advanced commerce and advertising features inside of messenger. He says that this new opportunity has not caught on yet other people in that you could be one of the first ones in on this. How much money can the system make you? But what he says is that he has made $28,432.22 in one single day in that this system runs 24/7… Making him so much money that he was able to buy his dream home in just two months. If you are familiar with my blog you know that I expose scams like this on a regular basis. I could go on all day about all the red flags I see here, but I will keep it short in just go over for quick red flags that really show this is a probable scam. The most obvious is that it just sounds too good to be true. And you know how the old saying goes… If something sounds too good to be true then it probably is. This old saying applies extremely well when it comes to the online world, which is absolutely plagued with scams. Another major red flag is that he doesn’t even tell you how the system makes you money. Sure, he explains that it takes advantage of some new market emerging inside of Facebook Messenger, but everything he tells you is incredibly vague. Keeping things vague and not providing any good details is a telltale sign of a scam. Red Flag #3 – Who is this Robert Walter guy? So first off, like I said, in the video presentation I don’t even think he mentions his name which is ridiculous. But besides that, even in the written sales pitch all he does is mention his name. There is no picture of him provided, no background information, nothing. The entire story about him losing his job and coming across that this system is probably completely made up. In fact, the guy “Robert Walter” is probably made up. Red Flag #4 – It only costs $9… ? It may sound awesome that this system only cost nine dollars. I mean nine dollars it is an much nowadays. However, doesn’t this make you a bit suspicious? I mean why would he be selling it for so cheap? Sure, sure… I know he says that he just wants to give back and wants to give everyone a chance to get in on this, but it isn’t like I haven’t heard sayings like this 1000 times before with other online scams. You or more than welcome to buy into this system if you want to, but I highly recommend avoiding it. I know I didn’t actually buy into this so I can’t say with 100% certainty that is a scam, but with my knowledge of how the online marketing world works and the different ways to make money out there, it sure as heck seems like a pure scam to me. I’ve been involved in online marketing since 2015 and make a living doing so. I’m always trying to keep up to date on new methods/techniques for making money online, and I can tell you for sure that exploiting some “China secret” is nothing that I have heard of as being legitimate. The in the good thing about this system is that is being sold through the digital marketplace ClickBank, which means that you will be able to get a refund if you buy into it and when your money back. I hope you enjoyed this review and found it helpful. If you want my recommendation for making money online I would highly suggest taking a look at how I went from $0 to over $6,000 a month online.